Dr. John Kokarakis has extensive experience in ship design and operations, spanning over forty years. He was a consultant of SEALAND, AMERICAN PRESIDENT LINES and Matson Navigation for numerous aspects of containership design, operation and repair. He has investigated various maritime accidents worldwide of more or less notoriety including EXXON VALDEZ, Piper Alpha, Drillship SEACREST, Space Shuttle CHALLENGER etc. He has served in various positions at ABS and Germanischer Lloyd with emphasis in design and construction. Currently, he is responsible for the technical business development in South Europe, Africa, Hellenic, and Black Sea & Middle East Zone at Bureau Veritas. His work focuses on the implementation of the "green" regulations with specialization in fuel saving techniques, slow steaming and speed optimization, hydrodynamic optimization, resistance and propulsion and performance monitoring. 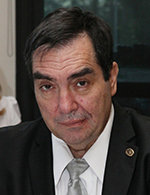 He is a member of the IACS Environmental Panel as well as the Chairman of the Greek Section of SNAME and the IACS/Industry Joint Working Group on MRV. A graduate of National Technical University of Athens, he also earned a doctorate and MSEs in Naval Architecture and Mechanical Engineering from the University of Michigan.